A recipe for a baked vegetarian and vegan frittata with tofu instead of eggs. Nutritional yeast provides a tangy flavor to this tofu-based vegan frittata. Similar to a quiche, this dish is perfect for breakfast or brunch. Try sprinkling some shredded cheese (dairy or soy) on top for even more flavor. Never made a vegan frittata and not sure what to expect? A vegan frittata made with tofu will have a similar flavor to an egg-based frittata dish, but the texture will be a bit different. 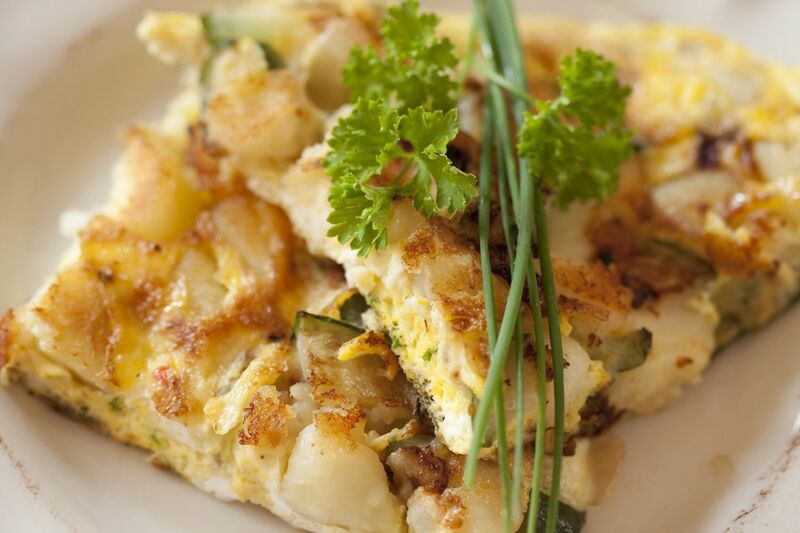 Eggs give a baked frittata a lighter and "spongy" texture, whereas the tofu makes vegan versions a bit denser with a "smoother" mouth feel when you bite into it. Nonetheless, the flavors are quite similar, and, done right with all those potatoes, green onions, and the salty "umami" of the soy sauce, you will hardly notice the difference. Especially if you serve up a few mimosas on the side! Fritattas make an excellent dish for a vegetarian Easter breakfast, brunch, or for a light lunch as well. First, drain and press your tofu. Most tofu will taste best if you press it first because tofu is like a sponge—the more water you gently press out of it, the more delicious flavors it can soak up! Once your tofu is well-pressed, preheat the oven to 325 F.
In a large frying pan, sauté the onions, garlic, and bottoms of the green onions in olive oil for 2 to 3 minutes. Add potatoes, salt, and pepper, and sauté for 10 to 15 minutes, stirring occasionally until potatoes are golden brown. Blend tofu, soy sauce, and nutritional yeast in a food processor or blender until well-mixed. The mixture will be somewhat thick. Add green onions and potatoes and pour into a greased pie pan. Cook 45 to 50 minutes until top is firm and cooked all the way through. While your frittata is still hot, sprinkle the top with cheese if desired. Allow the frittata to cool slightly before slicing and serving, as this will help it set and firm up a bit more. Enjoy!